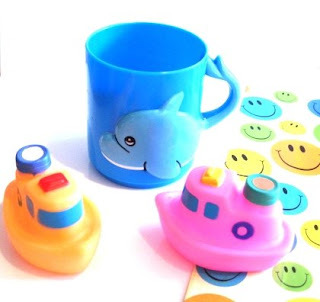 We've just added some new filled party bags for toddlers and preschoolers, which contain a sealife themed mug (dolphin or seal) and squeezy fish and/or boats. You also have the option of adding a Tinti water colour changing tablet, for extra excitement at bath time! The squeezy toys are great for playing with in the bath and or even out of the bath, and the mugs are the perfect size for small hands. As well as excellent bath toys (we use them for hair washing), they make lovely toothbrush mugs, and desk tidies for story pencils, crayons etc. Take a look at these and the rest of our baby and toddler party products. We're continually improving our range of filled party products, and I've just uploaded 2 deluxe versions of our filled animal mugs. The first one is our deluxed filled elephant mug . 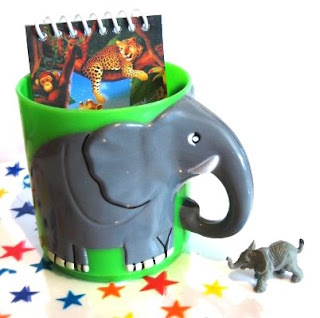 The chunky green plastic mug is filled with a spiral bound safari notepad, and a gorgeous miniature elephant. You have the option of an extra toy, and the whole thing is wrapped in a cello bag of your choice. The second new item is the deluxe filled dinosaur mug. The bright orange plastic dinosaur mug comes in 3 different designs, and is filled with a dinosaur spiral bound notepad and colourful stretchy lizard. As always, you have the option of an extra toy, and the whole lot is wrapped in a cello bag of your choice. We'll keep you posted on more new products as they are added. Win an Organised Mum Party Planner! With a gorgeous cup cake design to get you in the mood, the planner has space to organise up to 6 parties as well as tear-out shopping lists, guest lists and space to note who gave what present. With extra sections for noting useful contacts such as venues and entertainers and a storage pocket for receipts, this handy little book, which is available from Organised Mum for just £4.99, will make sure that nothing is forgotten. Funky Dory Party Bags sell a range of character party bags and loot bags, featuring favourite Disney, TV and movie characters, but only one of them is made from paper. Which one is it? Send your answer, along with your name and address to comp@funkydorypartybags.co.uk. All correct entries will go into a prize draw to take place on Friday, 14th August, and the first 6 entries pulled out will each receive an Organised Mum Party Planner. Good luck! For competition rules please see our competition page. Take a look at our latest new product - personalised cotton party bags. Each eco friendly unbleached cotton party bag measures 22cm x 23cm, and can be personalised with your child's name. As well as a truly unique party bag, this product also makes an excellent gift bag and wedding activity bag, and can be used long after the event for storing toys, crayons etc. 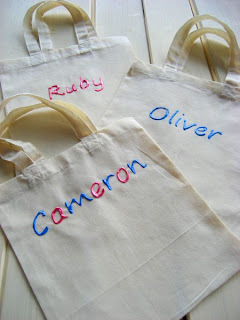 You can see them in the personalised cotton party bags section of our site. Made with natural ingredients and dermatalogically tested, Tinti bath products are kind to young skin and leave no residue. They are great fun in paddling pools and a great way of tempting hot and tired kids into the bath at the end of the day. Pop one into the paddling pool or bath, watch it fizz about and change the water colour to red, blue or yellow. Teach your very young children about primary and secondary colours by putting 2 tablets in and watching the colours magically mingle. You will receive a random selection of colours, and we cannot guarantee you will get 3 different colours. 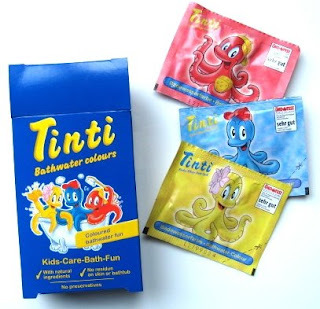 * To claim your three FREE Tinti bath water colour tablets, enter discount code TINTI at checkout.